The Kennebago River is located just outside of Rangeley Maine, in the western part of the state along rt. 16. The river is near the Maine and Quebec border at Big Island Pond in the township of Seven Ponds. Kennebago flows through the Little Kennebago Lake and into Kennebago Lake. 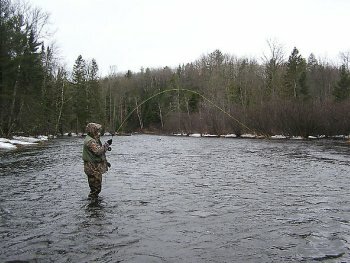 The river flows through a very difficult area to access remote section of Maine, and offers up some great mountain fly fishing. The only really good access is at the bridge on Route 16 where it crosses the stream. The fishing season starts in April but not until the ice has melted, so it normally doesn't start until mid May. The river is catch and release only from the middle of August until the end of the season, and it is fly fishing only. People come to this river for the Salmon fishing and for the great dry fly fishing that bring in the nice Brook trout that call this river home. The river has a predictable great run of Landlocked Salmon during September that bring anglers from all over to test their skills. The local Salmon average two pounds, but some of the landlocked salmon get as big as four pounds. Wet flies and streamers seem to work best on this stream including the Black Ghost and Gray Ghost patterns. 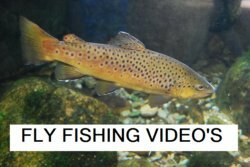 Most anglers leave the river from mid June to mid August as the weather gets warmer and the fishing falls off. In addition to the nice salmon that run through this stream, you will also find some Brook trout in this river. 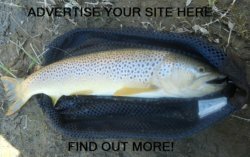 If you need help on how to fish for river trout check out this page for beginners fishing a stream. The Upper portion of the Kennebago River can be waded above and below Little Kennebago Lake. This is a very remote area that can also be fished by drift boat or float tube. Most of the larger fish in this river are in the lower section of the river. This area is more difficult to access but it can bring you some nice size fish. Be sure to have the right fly fishing gear when you hit this stream these are not normal size fish. Most of the best fishing on the Kennebago is going to require a little hiking also. Regardless of how you get there, you will want to get there because the fishing is pretty awesome. Map of the Kennebago area. Leave the Kennebago River and return to the Maine page.